These are the terms on which we supply swimming lessons to you or your children. Please read these terms carefully. These terms tell you who we are, how we will provide Services to you and how you and we may change or end the contract, what to do if there is a problem and other important information. How we will accept students onto swimming lessons. If you are interested in booking either yourself or a child onto one of our swimming courses or onto 1- to-1 (or 2 to 1) lessons you should first contact us to ensure that a place is available. If a place is available a welcome letter and invoice will be despatched and payment will be taken. These terms and conditions together with the welcome letter and first invoice form the contract between us. Places on swimming lessons are not secured until payment has been made. If you wish to change the time or location of your lessons please contact us. We will let you know about any changes to the price of the course or anything else that would be necessary as a result of your requested change. We reserve the right to change the location of any booked lesson to an alternative pool at a location which is reasonably close to the original pool. This will be done if the pool is unavailable for any reason which may include closure or contamination of the pool. We will give you as much notice as possible of the change. We reserve the right to change the instructor of group lessons and 1 to 1 lessons to accommodate staffing issues such as holiday or sickness. We will not usually notify you of such change. We reserve the right to make changes to the pricing of our lessons and courses. You will be notified of any such changes via your invoice. If you, or your child, or any other person accompanying your child fails to comply with any rules imposed by the pool or venue. In extreme cases or in cases of repeated instances of breach of the rules contained within these terms and conditions, we reserve the right to terminate this contract and cancel the participants place on any course or future lessons without notice and without credit or refund. You must provide complete medical background information on participants and inform us of any change to such information. You must take responsibility for ensuring that the participant is fit, well and free from any infectious ailments. No photography is permitted either during lessons or afterwards (whether of your own child or of others). Instructors may, on request and in their sole discretion, permit you to take a photograph of your own child at the end of a lesson. Please refer to STA Child Protection Guidelines. Participation in lessons is dependent upon payment of the fees in full. Should payment not be made within the timescales outlined in these terms then a Students place will be revoked and offered to a student on the waiting list. Participants on 1 to 1 (or 2 to 1) classes only may cancel a lesson giving at least 24 hours’ notice. Where lessons are cancelled you will be responsible to pay for the cancelled lesson at the rate of 50%. Refunds will be credited to the account of the participant and may be used in full or part payment against further bookings. Failure to give at least 24 hours’ notice of cancellation will mean that you will responsible for the entire cost of the lesson. Participants on group lessons will not be entitled to a credit or refund if they are unable to attend their booked lessons. We are unable to offer the rescheduling of lessons missed due to absence. Where an event occurs which means that we are unable to proceed with a lesson and we are unable to change the location of the lesson or the instructor (as applicable) we reserve the right to cancel the lesson. In the event that we cancel a lesson credits will be issued to the account of the participant and may be used as part payment for future courses. Where cheques are returned unpaid by the bank you agree to reimburse any charges/ costs incurred by us in connection with the unpaid cheque. Once accepted into swimming lessons, students will be automatically booked onto future blocks of lessons. You may cancel future block bookings by informing us as soon as possible and in any event before payment for such course is due, however, cancellation is not permitted for blocks of lessons which the student has started but has not finished. Our prices include VAT. If the rate of VAT changes we will adjust the price that you pay, unless you have already paid in advance for the services. Fees must be paid before each terms lessons commence. Places on swimming courses are allocated on a ‘first come first served’ basis but customers are reminded that only payment will secure a place on a swimming course. We will send you an invoice for the next block of lessons at least 10 days before payment is due. We accept payment over the telephone, by BACS or by cheque. Payment should be made by the date specified on the invoice. Requests are sent by email to the address provided to us by you. Please note that failure to make payment before the invoice date will result in the participant losing their place on the course. with your consent, to give you information about similar services that we provide, but you may stop receiving this information at any time by contacting us. Personal information will not be shared with third parties and will be kept in accordance with the Data Protection Act 1998. Even if we delay in enforcing this contract, we can still enforce it later. If we do not insist immediately that you do anything you are required to do under these terms, or if we delay in taking steps against you in respect of your breaking this contract, that will not mean that you do not have to do those things and it will not prevent us taking steps against you at a later date. For example, if you miss a payment and we do not chase you but we continue to provide the lessons, we can still require you to make the payment at a later date. Parent and Baby swim classes involve lots of play to help the children learn. We also use submersion techniques to help the children feel confident in the water. Children can start from just 6 weeks old. 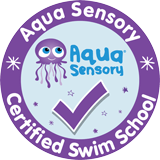 We also offer Aqua Sensory from 6 months up. We offer small group swimming lessons for children, with no more than five children in a group you are assured that your child receives the individual attention important to develop their swimming skills. The children will learn all the safety aspects of swimming without their parents. One to one swimming lessons help children to learn with confidence. We can adapt the structure of the lessons to suit your child’s individual needs. Private swimming lessons provide the greatest flexibility and one-on-one attention for swimmers of any age, beginners or improvers. Aqua natal classes are the best way to ease pregnancy aches and pains along with a full body workout. Feel weightless in pool and forget about the stresses and strains on your body. We offer a range of products including kids swimming goggles, hoodies, water bottles and swimming hats. All our products are tried and tested so you or your child can experience the best swimming lessons possible. We absolutely love to hear from our clients. Drop us a line and we'll discuss how we can help with your enquiries.